The first step (in the 15-step climb to the church of the Firstborn) considered was faith in God and Jesus Christ. As Amulek taught, faith leads unto repentance (Alma 34:15). Below, I share a few thoughts on that topic. In the end, I've added some one-liners on repentance. Feel free to add your own in the comments section. The final (as far as I can see from where I’m at right now) stage of repentance is to face God being willing to empty your heart, mind and soul from anything that takes up the space that God wants to fill with his love, light and truth. The traditions of our fathers, the philosophies of men mingled with scripture, the precepts of men, it all needs to go. But that’s not a work that’s done by you and me. We aren’t necessarily aware of the falsehoods we espouse and perhaps cherish. We don’t empty us, but show a willingness to let it all go, a willingness to be shown what’s false and what’s true, and then God will make the exchange. He will give us beauty for ashes, oil of gladness instead of mourning and the mantle of praise instead of a spirit of fainting (Isa. 61:3). ”May the Lord grant unto you repentance.” (Alma 13:30) The chance to repent is a gift, just like the change that’s wrought in us when we receive this gift. Repentance isn’t so much about God’s willingness or timing (D&C 88:67-68), but about us. God is always willing to give us what is already ours (Christ has finished his preperations unto us, and invites/commands us to repent and receive – D&C 19:15-20), but he can't unless we ask for it, with enough space in our arms and hearts to receive. As these concepts have started to fill my heart and mind, I understand that it’s not about all that I can do, but rather what He can do. Repentance is about our hunger for his nearness, his words, his truths, his light, and his love and desire to fill us with what we lack, when we are ready to receive. When the story of heroes is told.This mystery begins to unfoldThe life with the greatest rewardIs the life turned over to the Lord.A hero achieves his greatest good.When he seeks to know the will of God.He can make more of a man than any man without him ever can.He’ll deepen your joys.Strengthen your arms.Comfort your soul.Keep you from harm.Fill you with power through his loving grace. I believe that He truly ”can make more of [me than I can] without him.” The task at hand is to let that belief develop into a desire and a hunger to experience the mighty change offered me. I believe it’s possible to distinguish between two types of repentance–preparatory and saving repentance. Preparatory repentance means that we stop doing things we ought to avoid, thus helping us get rid of the need to put effort into responding to the effects of bad choices. saving repentance is something entirely different. It’s about changing the thoughts and intents of our hearts, realigning our will with God’s and focusing our efforts and eye of faith on the things that matter most. In essence, this is what king Benjamin taught his people. King Benjamin taught that ”the natural man is an enemy to God, and has been from the fall of Adam, and will be, forever and ever, unless he yields to the enticings of the Holy Spirit, and putteth off the natural man and becometh a saint through the atonement of Christ the Lord, and becometh as a child, submissive, meek, humble, patient, full of love, willing to submit to all things which the Lord seeth fit to inflict upon him, even as a child doth submit to his father.” (Mosiah 3:19) This is a dualistic process. First off, the natural man is to be put of. Doing that might entail subtracting things from your life. Secondly, you need to put on Christ. That’s all about adding to the divine that’s already within you. You go from minus to zero, then from zero to plus. Alma the younger is a great example of this. He went about ”with the sons of Mosiah, seeking to destroy the church of God” and murdering ”many of his children, or rather [leading] them away unto destruction.” (Alma 36:6, 14) After experiencing a brutal awakening to his awful situation, Alma turned to the Lord for mercy. The Lord answered hi sprayer, with the following effects. Alma’s experience is edifying. We are taught about the state we are brought to before we, from the depth of humility, can cry out for God’s saving grace (less than the dust of the earth, as another group felt – Mosiah 4:2), we are taught what we should ask for (not for the strength to undo, repair or carry our anguish, but rather for mercy and forgiveness), and the consequences that follow a rebirth by God. There is much here that will help us experience our own change of heart and rebirth. The “doctrine of the steps of repentance” has taken its hold on the Church. I’m not sure it’s doctrinally correct or even spiritually helpful. Checklists are for chores and things needed to be done, whether or not the person performing the tasks want to do it, enjoy, do it well or even thinks it needs to be done. This is especially true if handed a checklist written by someone else. When we repent by checking of a list, something spritiual, mental and psychological is reduced to mere mechanics. We say and do the right things and then go on with our lives. And we often end up in the same mess, needing to go through the steps once more. This procedure gives the concept of repentance a bad reputation. For many, repentance is the neighborhood thug who’s always around and makes everyone else nervous, for you never know where he’s going to cause mischief next. 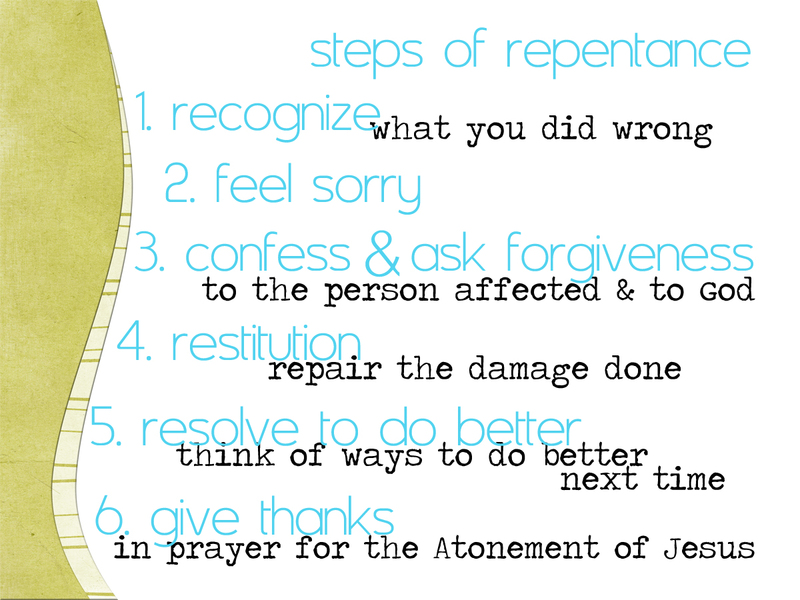 Repentance is more than just a few steps. It’s a concept and principle of inclusion and addition that permeates pretty much everything else (at least the steps to the church of the Firstborn). The conditions of repentance bringeth unto the power of the Redeemer. What are the “conditions of repentance”? This question might be answered best if we first try to understand what the power of the Redeemer is. Abinadi taught (in Mosiah 15:7-12) that “he shall be led, crucified, and slain, the flesh becoming subject even unto death, the will of the Son being swallowed up in the will of the Father. This teaching about who the seed of the Lord are, is echoed by the description (given by Mormon) of the Nephites who survived the upheavals and calamities caused at the time of Jesus’ death at Golgatha. This might seem like an easy task–"Not stone the prophets and not shed the blood of the saints? I can handle that!" I believe most of us would think that we pass that threshold. But how about receiving the prophets. Which prophets? The quorum of the twelve and the first presidency? I would suggest, for anyone interested in the question “What is a prophet?” to read the 48-page answer from Robert Sonntag. For me, the role of prophet has never been about position in a hierarchy or being viewed as a prophet by other people. It’s more a question about whether the person acts like a prophet or not. Joseph said that “a prophet was a prophet only when he was acting as such.” (TPJS p. 278) This pretty much sums it all up – if a man, or a woman, never acts as a prophet (conveys messages from God), that person cannot be a prophet. Back to repentance. Receiving the prophets is the same as repenting, for with almost no exception, all the holy prophets have preached ”naught but repentance,” just as we are commanded to. (D&C 19:21). Repentance brings us unto the power of the Redeemer. Repentance could, and maybe should, encompass every other part of receiving the Lord and coming to Jesus. Since our repentance isn’t complete before we’ve attained unto the resurrection of the dead (see TPJS p. 346-347; this is somehting other than being resurrected), repentance might be considered synonymous with the Gospel, the plan of salvation and redemption. But that’s just semantics. The above quoted scriptures make abundantly clear that the power to become His sons and daughters are ours only after we have received Him, and we receive him by repenting, being baptized in water and the receive the baptism of fire and the Holy Ghost. Unless we’ve come this far, we’ve not received Jesus. Repentance is initially about subtraction, and if it doesn’t turn into a process of addition, it has only taken you half way. 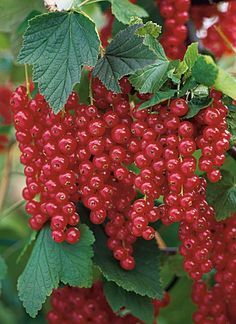 Repentance isn’t about putting us back into the innocence of the Garden, but rather to make us gardeners.